It all started last week after Ellie’s soccer practice. 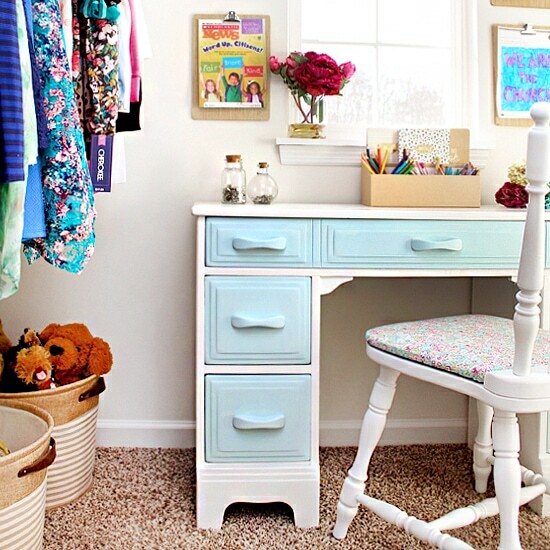 I was in her closet grabbing some clothes and noticed her desk could really use a new coat of paint on the drawers. So while I threw Ellie in the shower, I grabbed the paint I used on her nightstand and painted her desk drawers… in like 20 minutes. I finished just in time to help Ellie brush her hair and tuck her into bed. Easiest makeover ever. Love the natural light this space gets from that window. But since I didn’t want any valance blocking the light, I just hung some simple burlap bunting across the top. I stocked the top of her desk with some journal paper, crayons & colored pencils since the kid is a budding artist. Then on either side of the desk I put some clipboards I found in the Target dollar bins. I attached them to the wall with Command Brand strips so she can take them down and play with them. Plus I love that she can change out her artwork or “lesson plan” when she plays school. 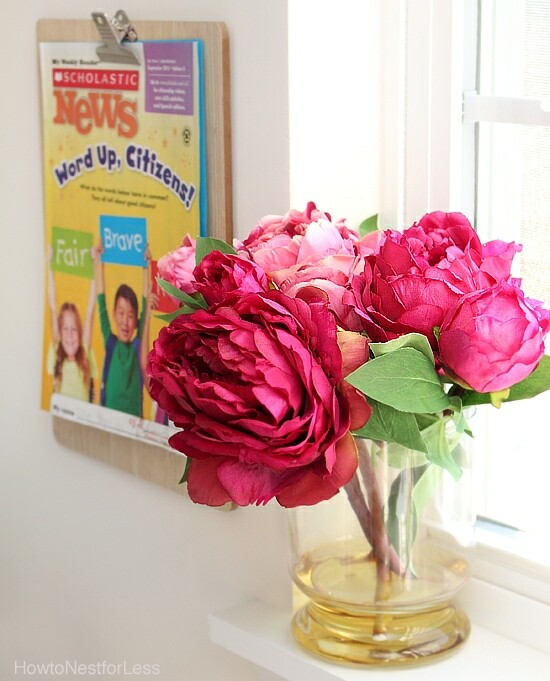 On top of the window sill I added a little flower arrangement I had from my old craft room. The chair I spray painted white and recovered with a floral fabric that I let Ellie pick out from Joanns. I told her as long as the fabric had a little teal blue color in it she could pick whatever she wanted. And about 30 minutes later she finally narrowed it down, hah! 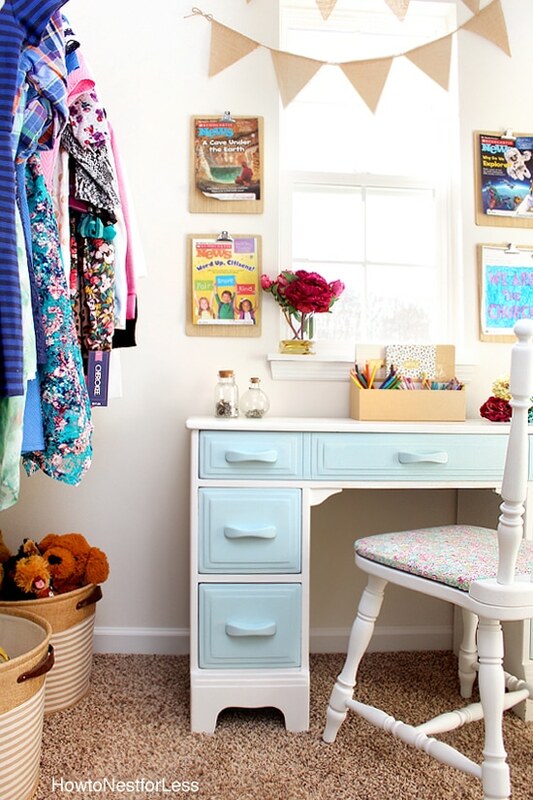 To the left of the desk is most of her hanging clothes. Luckily this kid wears a uniform everyday so doesn’t need much this winter. We also packed away her old clothes and handed them down to her younger cousin. Below her clothes are some new bins from Target to hold her stuff animals and random toys and treasures (like her Cardinals hat and pink sparkle purse). 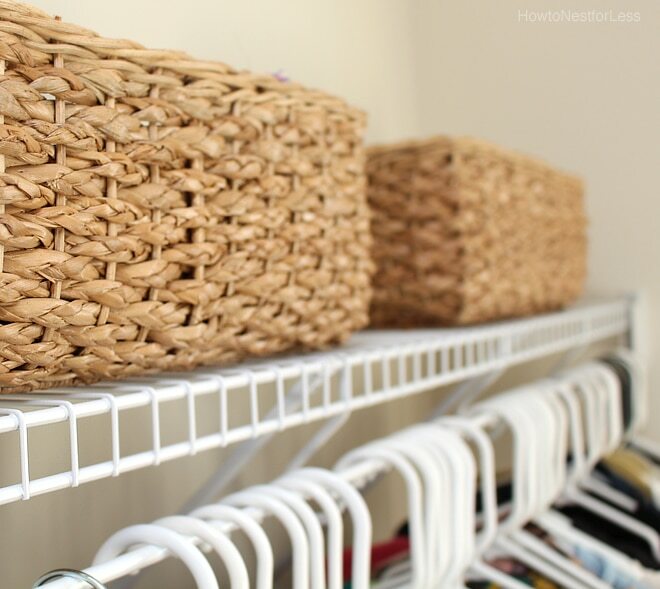 Above on the wire shelf are two new woven baskets for off-season clothes like swimsuits. The wall across from her desk is for Ellie to have some fun with posters & drawings. I figured what are some pin holes in the wall, right? 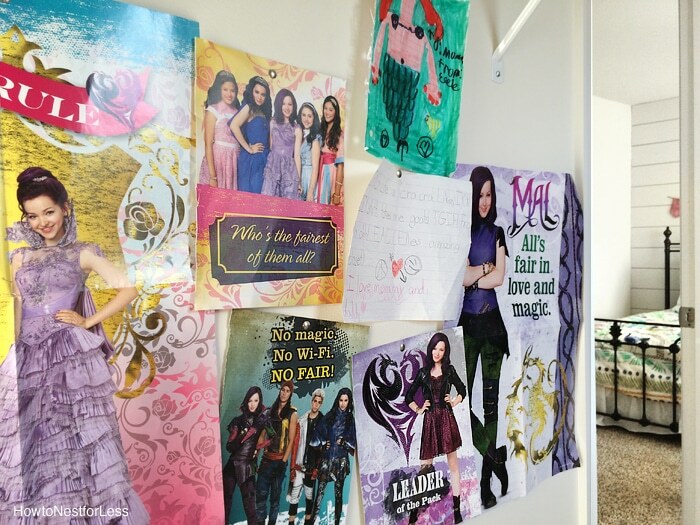 She’s seven years old and addicted to Disney’s Descendants so of course the wall is adorned mostly with Mal posters. So now that her closet has a fun little makeover I need to get back to finishing her actual bedroom. Not too much left to do, basically just paint her other 3 walls, paint her chest to match the nightstand, build some bookshelves and hang some artwork. Getting close though! 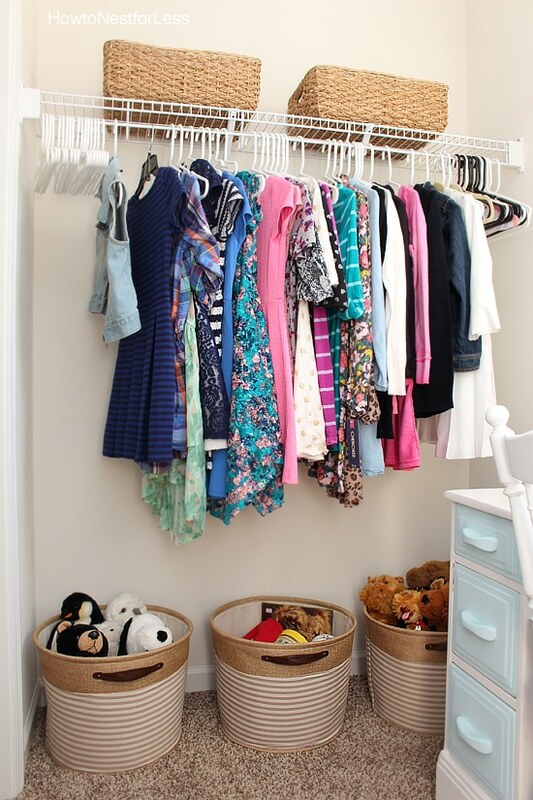 I wish I had a closet that size as a kid! 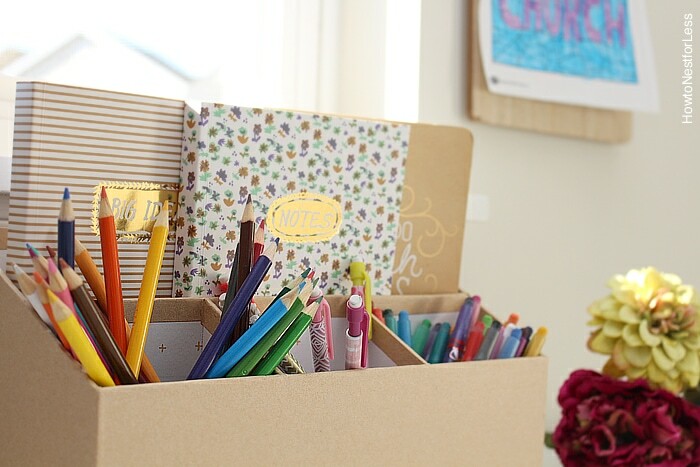 Love the updated desk drawers and the clipboards above the desk– great idea! What’s really crazy is that this closet is about half the size as her old one. Poor kid. Sooo cute! 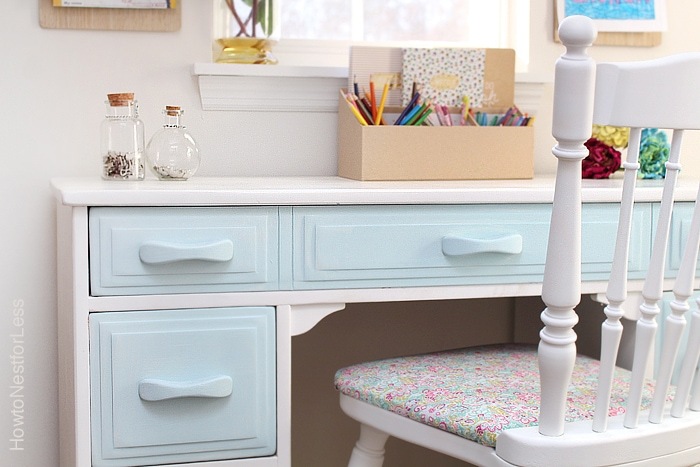 I love the chair fabric…she definitely has a good eye for design. The clipboards are genius for a budding artist..and teacher…and maybe a budding fashion designer. 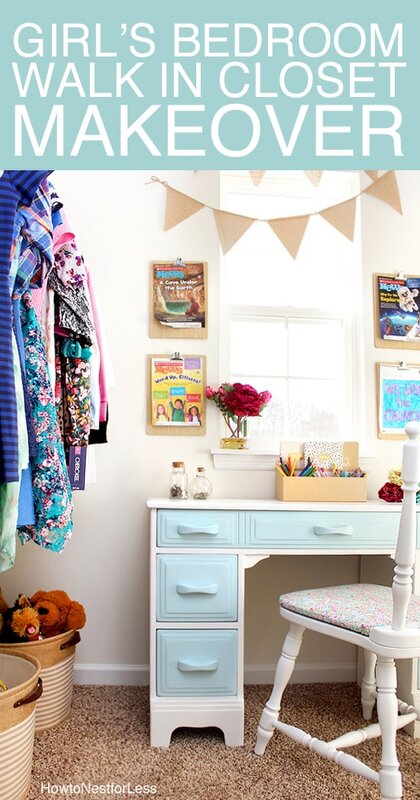 Her desk make-over looks adorable! I love the bunting over the window. 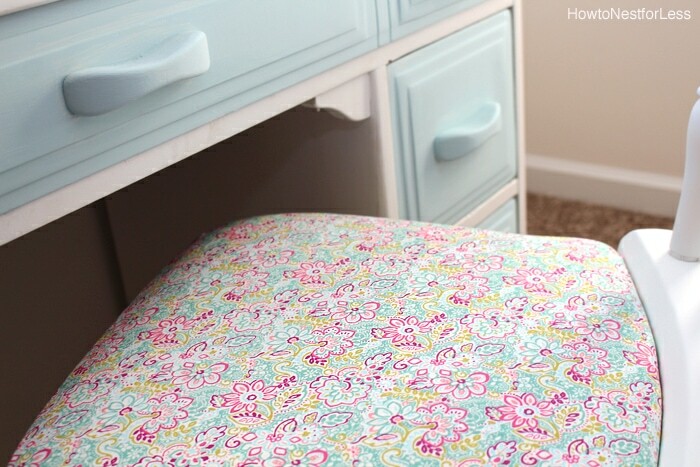 This post totally motivated me to finish the spruce-up of my daughters room! 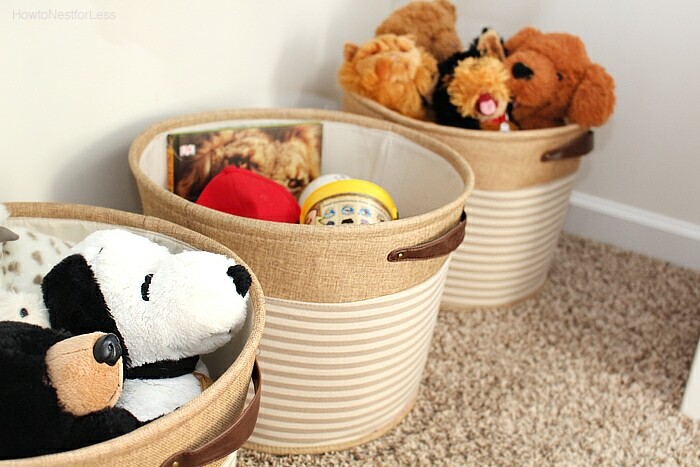 We started to organize it, but then I totally failed at getting it decorated. Hah! Well then you can motivate me to finish the rest of Ellie’s bedroom! Awesome closet! 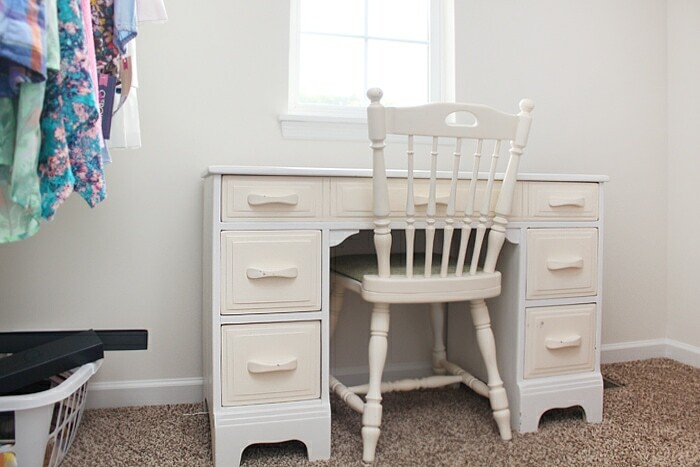 I love how the chalk paint looks with the white of the desk. So pretty. I can’t remember if I asked you this or not, but do you notice that chalk paint to have a smell? I bought some of it at Ace Hardware and then returned it, because it leaked all over the bag on the way home. The smell of it was awful, so I didn’t exchange it for another. I’m not going to say what it smelled like on here. LOL!